Amir Khan recalls just how good Jose Benavidez Jr. was when Benavidez had two fully functional legs. Khan’s knowledge comes from when he and Benavidez sparred “loads of times” at Freddie Roach’s Wild Card Boxing Club in Hollywood. England’s Khan noticed a compromised Benavidez while watching footage from Benavidez’s fight against Terence Crawford. Khan commended Benavidez for giving Crawford some problems, particularly within the first five rounds of their WBO welterweight title fight October 13 in Omaha, Nebraska, Crawford’s hometown. The former junior welterweight champion also recognized the limitations Benavidez’s lingering leg injury placed on him. Benavidez suffered significant injuries to his right leg when he was shot during an unsolved August 2016 incident in his native Phoenix. The 26-year-old contender wears a protective sleeve on his right knee when he boxes these days and his movement seemed limited at times versus Crawford. The undefeated Crawford was ahead on all three scorecards – 110-99, 107-102 and 108-101 – at time their fight was stopped in the 12th round. 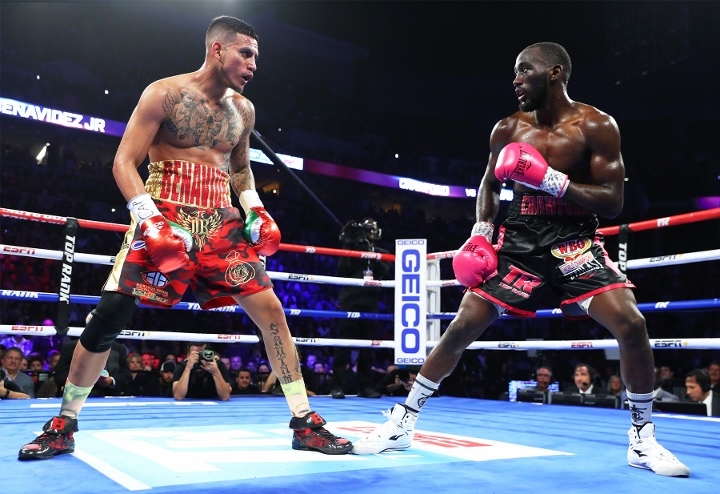 Crawford blasted Benavidez with a vicious right uppercut that floored the challenger. A staggered Benavidez got up, but Crawford unloaded a combination of power punches that made referee Celestino Ruiz step in to stop their bout with 18 seconds left in it. Khan can’t help but wonder how the taller, strong Benavidez might’ve fared with Crawford if he were at full strength. The 2004 Olympic silver medalist assumes that injury has impacted the 26-year-old Benavidez “quite badly” from mental and physical standpoints because Benavidez knows he isn’t the same fighter anymore. Crawford (34-0, 25 KOs) will fight for the first time since beating Benavidez (27-1, 18 KOs) when he encounters Khan a week from Saturday night in an ESPN Pay-Per-View main event at Madison Square Garden.